Celestron’s new 280mm (11-inch) aperture f/2.2 Rowe-Ackermann Schmidt Astrograph is a heavyweight imaging system in every sense of the word. 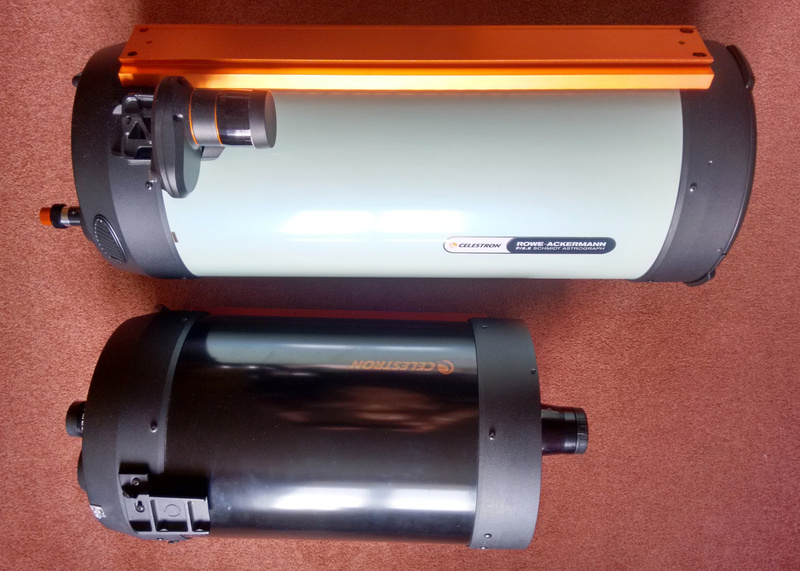 Its 84cm-long, 32cm diameter optical tube tips the scales at 43lb (19.5kg), so it requires a CGEM-DX (shown here) or GGE Pro-class German equatorial mount or larger. Full length Losmandy-style D-plate mounting bars are provided top and bottom for mounting the OTA and a separate guidescope. Image credit: AN. Many an accomplished astroimager started out by taking 10- or 20-second constellation portraits with a digital DSLR camera equipped with a standard f/2 or f/2.8 lens on a fixed tripod. By the time he or she has invested in a driven mount designed to track the stars, one- or two-minute exposures of the Milky Way at high ISO ratings will reveal a seemingly infinite number of stars. Careful inspection of such images will also reveal pinkish-red emission nebulae, sights that lead many a budding astrophotographer to become hooked on deep-sky imaging. Most people drawn to astrophotography are detail-orientated and technologically savvy – particularly if they were long-time amateur astronomers before moving into astrophotography. However, those that enter astroimaging by the hobbyist photographer route can become quickly disillusioned by the associated technology (equatorial mounts and autoguiding, for example) and hanker after the simpler camera lens approach. Is there a way to simplify the astroimaging process and reduce exposure times dramatically? Celestron believed so, and this was the impetus that drove the company’s optical engineers to develop the Rowe-Ackermann Schmidt Astrograph (RASA) profiled here. An astrograph is a telescope designed for astrophotography rather than visual use. It possesses an optical system highly corrected for optical aberrations and is typically ‘faster’ than telescopes designed for use with an eyepiece. A typical refracting astrograph may be f/6, while a reflecting design may be f/4. Recall that the focal ratio (or simply f/ratio) is the focal length of the instrument divided by the aperture of its primary lens or mirror. At f/2.2, Celestron’s RASA is clearly very fast indeed, comparable to prime DSLR lenses. 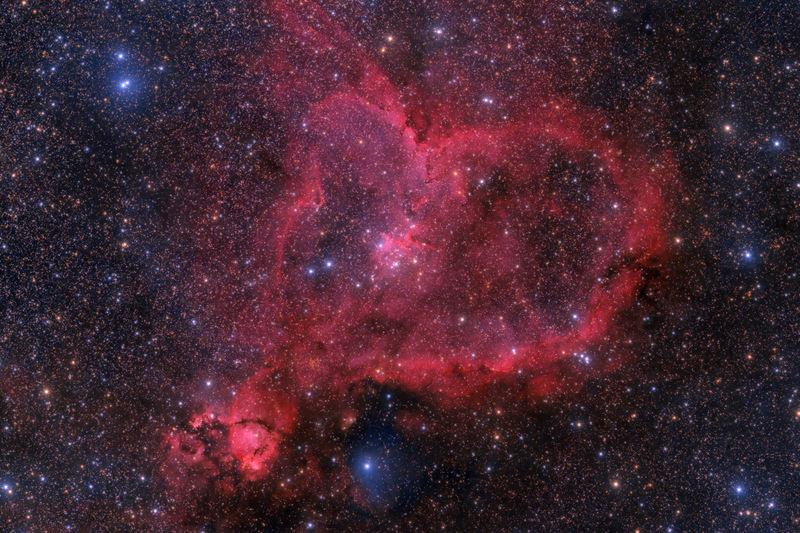 Jimmy Walker’s fantastic image of the emission Heart Nebula (IC 1805) was captured with a FLI Microline 11002 CCD camera on the RASA in 12 x five-minute unguided exposures on a Bisque mount under New Mexico skies. Image credit: © Jimmy Walker, used with permission. Thinking back to simple Milky Way portraits with f/2 lenses, the reason why so much extended detail in emission nebulae is recorded in such short exposures is because of the fast focal ratio. Suppose one has two lenses of 50mm aperture, where one is f/2 (i.e., a focal length of 100mm) while the other is f/4 (200mm focal length). If we use each lens to take an image of an open star cluster using identical length exposures and ISO ratings, both will record the same number of stars, since stars are point sources. However, if we now turn the same equal aperture lenses to an extended object such as the Orion Nebula, the f/4 lens will require an exposure four times longer than the f/2 lens in order to record the same degree of whispy detail, since the same light is being spread over four times the area (but the f/4 instrument will show the Orion Nebula at twice the scale). Similarly, a f/2 lens or mirror is twice as fast as one of f/2.8, or sixteen times as fast as an f/8. Mathematically, then, photographic speed is proportional to the square of the focal ratios. In the hands of an expert astrophotographer with a large-format CCD, Celestron’s Rowe-Ackermann Schmidt Astrograph delivers jaw-dropping images. 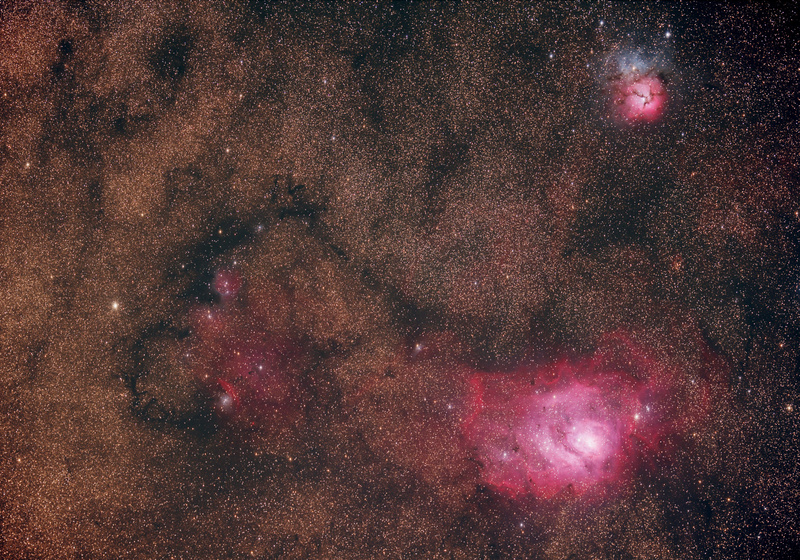 Bryan Cogdell used a full-frame QHY11 CCD camera on the RASA to capture this stunning portrait of the Lagoon Nebula (M8), Trifid Nebula (M20) and NGC 6559 in Sagittarius. Bryan took 45 x one-minute shots for the composition. Image credit: © Bryan Cogdell, used with permission. Celestron’s RASA can trace its lineage directly to a revolutionary catadioptric (an optical instrument using both lenses and mirrors to form an image) invented by Bernard Schmidt of the Bergedorf Observatory, Hamburg in 1930. Schmidt’s design used a spherical primary mirror of 14-inch diameter and f/1.7 focal ratio; incredibly fast for the time. He realised that the severe spherical aberration of such a mirror could be cancelled out by placing a specially shaped weak aspheric lens – known these days as a Schmidt corrector – located in front of the primary mirror at its radius of curvature. The result was a fast camera with a very wide field of view, ideally suited to photographing the sky quickly, which was important in the era of slow-speed film. Celestron in the U.S.A. was the first company to perfect a commercial process for the mass-production of the hitherto hard-to-make Schmidt correctors, and by the early 1970s had a 5.5-inch f/1.65 Schmidt camera in production. By the middle of that decade, it added an 8-inch f/1.5 Schmidt camera and, later still, limited quantities of 14-inch Schmidt cameras. While Celestron’s Schmidt cameras of 40 years ago operated at photographic speeds way in excess of anything but the fastest lenses, they were still specialist instruments that required more than a modicum of expertise to use. Nevertheless, they revolutionised the art of imaging. 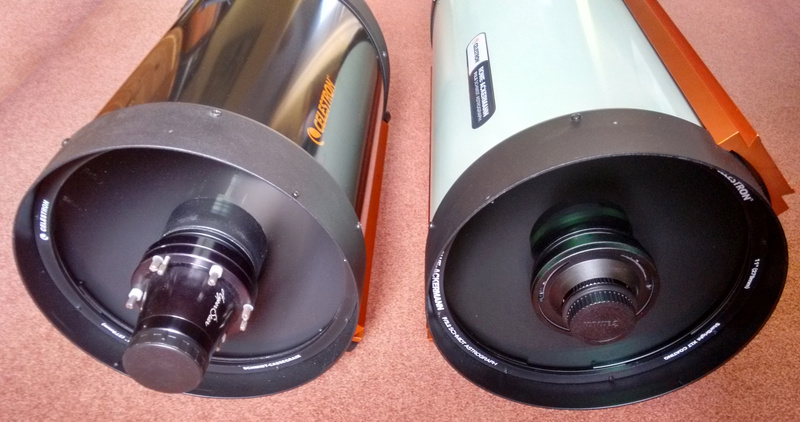 A HyperStar3-enabled Celestron C11 optical tube (left) permits one to image at similar photographic speeds to the new Rowe-Ackermann Schmidt Astrograph (RASA), but the HyperStar corrector lens system is not optimised for the optical tube that it is used with. RASA is a tightly-integrated system optimised for full-frame sensors, whereas HyperStar3 is limited to APS-C-sized DSLRs. Image credit: Ade Ashford. Fast forward to 1997 and CCDs were making a name for themselves in the astrophotography world, quickly supplanting traditional film photography owing to their speed and convenience. This was the year that Celestron teamed up with the Santa Barbara Instruments Group (SBIG) to produce Fastar, a revolutionary add-on to Celestron’s hugely popular Schmidt-Cassegrain (SCT) optical system. With Fastar, the SCT’s secondary mirror is removed and replaced a field-flattening lens assembly so that a CCD camera can be used in the front of the telescope at the f/1.95 focus of the instruments’s primary mirror. The potential is awesome, since exposures are 25 times shorter than if the camera was placed at the instrument’s native f/10 focus. For example, galaxies and nebulae can be captured with integrations of 30 seconds. Celestron soon realised that while Fastar undoubtedly produced good images very quickly with the small CCDs available at the time, such an add-on needs to be matched to the optical system if it is to be optimised for larger sensors off-axis. The Fastar lens for the 11-inch Schmidt-Cassegrain was never put into full production, so US-based Starizona started produced their own fast corrector lens system called HyperStar for the 11-inch SCT in 2002. 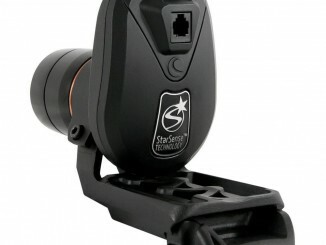 Starizona now produces HyperStar solutions for most Celestron SCTs from the C6 up. Great though HyperStar is – I have a HyperStar3 permanently installed on my C11 – it is an add-on that is not optimised for the optical tube it is used with. 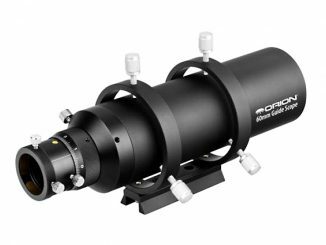 Celestron’s new Rowe-Ackermann Schmidt Astrograph dwarfs a C11 Schmidt-Cassegrain optical tube equipped with HyperStar. The latter is the only combination that can match the RASA’s phenomenal speed, but not the new astrograph’s optical quality. Note the Celestron StarSense AutoAlign accessory mounted on the RASA. Since the exposure times required with RASA are so short, a separate guidescope is not always necessary. Image credit: Ade Ashford. As with Fastar, a HyperStar corrector lens system for a C11 replaces the SCT’s secondary mirror and enables a CCD camera or a DSLR camera body (with appropriate adaptors) to sit at the focus of the primary mirror to operate at f/2 (560mm focal length). With focal ratios this fast, the optical system is very sensitive to errors in collimation, so the HyperStar unit is adjustable to allowed sharp star images over the entire field. This is fiddly to do, which is why I choose to leave my HyperStar permanently in place. While the images are very good to the corners of APS-C-sized DSLR sensors (22.2mm x 14.8mm, or 2¼° x 1.5°), there is considerable vignetting, so flat fields have to be taken to compensate. Also, the largest usable CCD chip that can be used is 27mm diagonal, so full-frame DSLRs are out. 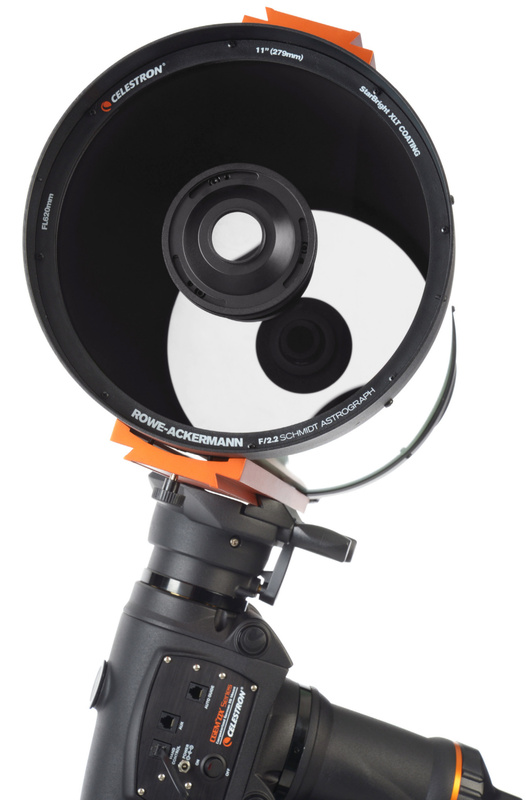 Celestron’s Rowe-Ackermann Schmidt Astrograph (RASA) also permits you to place your CCD camera or DSLR at the focus of the instrument’s primary mirror after its light passes through a fixed, internal corrector lens assembly – but any resemblance to a HyperStar system ends here. RASA is largely the brainchild of two very talented optical designers, Dave Rowe and Mark Ackermann. Rowe studied astronomy and astrophysics at Caltech, holds 15 patents and designed and built many instruments for Celestron and PlaneWave Instruments. He also worked closely with Celestron in the development of StarSense technology. Mark Ackermann, Ph.D has published dozens of optical telescope design papers and holds six US patents related to optical systems. RASA is a patent pending design. 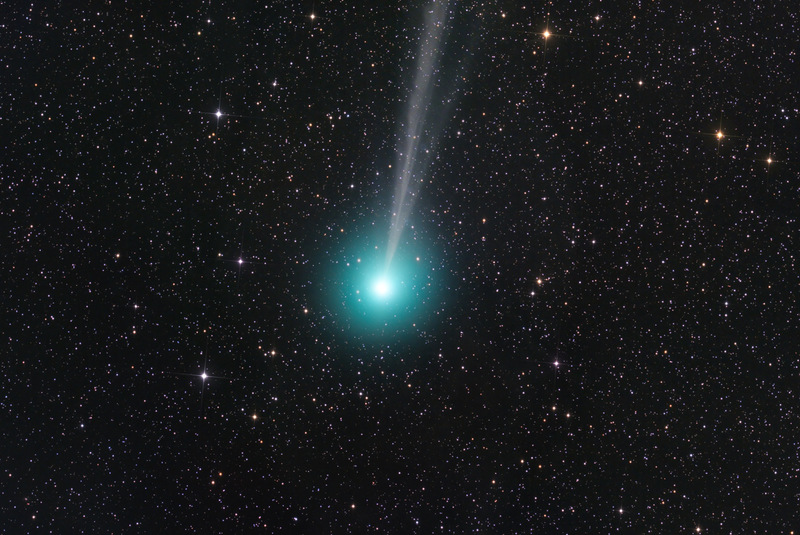 Jimmy Walker’s ethereal image of Comet Lovejoy C/2014 Q2 was also captured with a FLI Microline 11002 CCD camera on the RASA, this time in 20 x two-minute exposures on a Bisque mount, also under New Mexico skies. Image credit: © Jimmy Walker, used with permission. Conceived and engineered as a complete f/2.2, 620mm focal length astroimaging system optimised for peak performance with large-format CCD cameras and DSLRs, RASA’s internal 4-element lens group (with rare-earth glass for suppression of false colour and aberrations like coma and field curvature) is designed to deliver a 4.4 μm RMS spot size across a 4° field of view, or a 43.3mm diameter image circle. Published data shows two-micron spot sizes 22mm off-axis, so you can use a CCD sensor with very small pixels and the instrument will realise the full resolution of the camera. 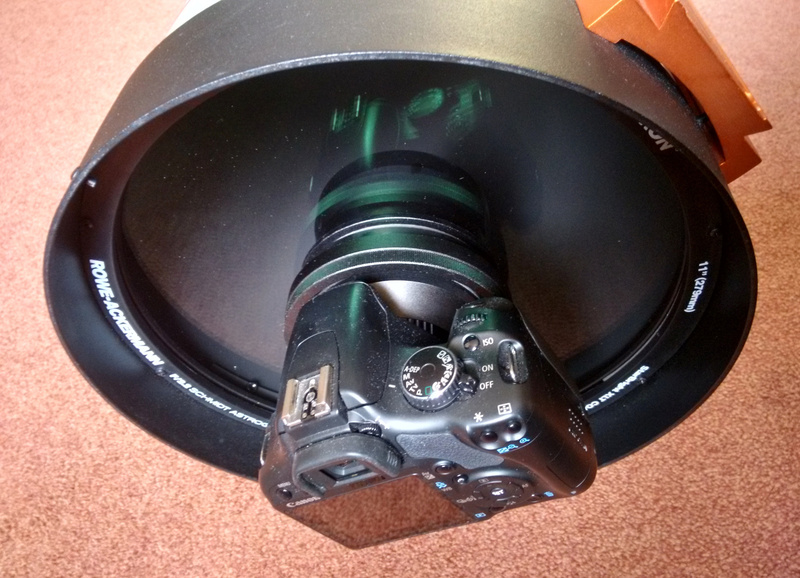 While it is often stated in the literature that the 11-inch RASA offers a 70mm optimised image circle, this figure actually applies to the 14-inch model intended for science-grade, wide-angle space situational awareness activities. Even so, the commercial 11-inch RASA has a 52mm diameter useable field, meaning that enormous 36.8 x 36.8mm CCDs like the Kodak KAF-16803 may be used with it. Full-format DSLRs are therefore easily accommodated for 3.3° x 2.2° fields, so 42mm T-thread and 48 mm camera adapters are provided (55mm back focus). RASA provides 78 percent illumination at the corner of a full-frame DSLR sensor, easily compensated by flat fields. APS-C-sized sensors are essentially full illuminated across their 2.0° x 1.4° fields! 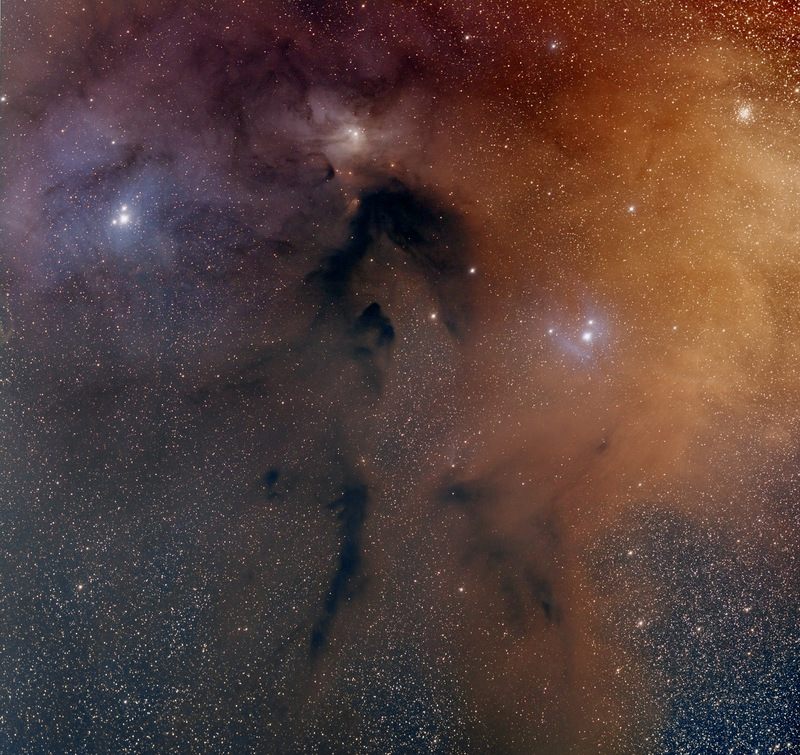 This is another image from Bryan Cogdell who once again used a full-frame QHY11 CCD camera for this two-panel mosaic of the Rho Ophiuchi region, where each panel was composed of 25 two-minute shots. The mount was a Celestron CGEM DX. Image credit: © Bryan Cogdell, used with permission. For imaging in light-polluted areas, Celestron has teamed up with Astrodon to produce a 72mm diameter screw-in replacement for RASA’s muti-coated optical window to ensure that no wavefront changes occur – careful attention to detail that is typical and found throughout the instrument’s design. The filter provides over 90 percent transmission at critical wavelengths to maintain a neutral colour balance. While on the subject of coatings, the RASA has StarBright XLT optical multicoatings as standard for the highest possible light throughput. The rear cell of the RASA has the primary locking clutches as implemented on the Edge HD models to ensure that absolutely no primary mirror movement occurs while imaging. Since there is no baffle tube as found in a conventional SCT, a solid steel shaft and improved brass bearing focusing system dramatically reduces image shift. A beautifully smooth 10:1 reduction FeatherTouch micro focuser that is RoboFocus compatible ensures easy and repeatable focusing with a Bahtinov mask . Finally, a 12V Maglev cooling fan improves airflow for better cooling of the optical tube to ambient temperature, reducing thermal effects. The rear cell of the RASA has similar primary locking clutches to those of Celestron’s Edge HD models to ensure that absolutely no primary mirror movement occurs while imaging. A solid steel shaft and improved brass bearing focusing system combined with a beautifully smooth 10:1 reduction FeatherTouch micro focuser that is RoboFocus compatible ensures easy and repeatable focusing with a Bahtinov mask. 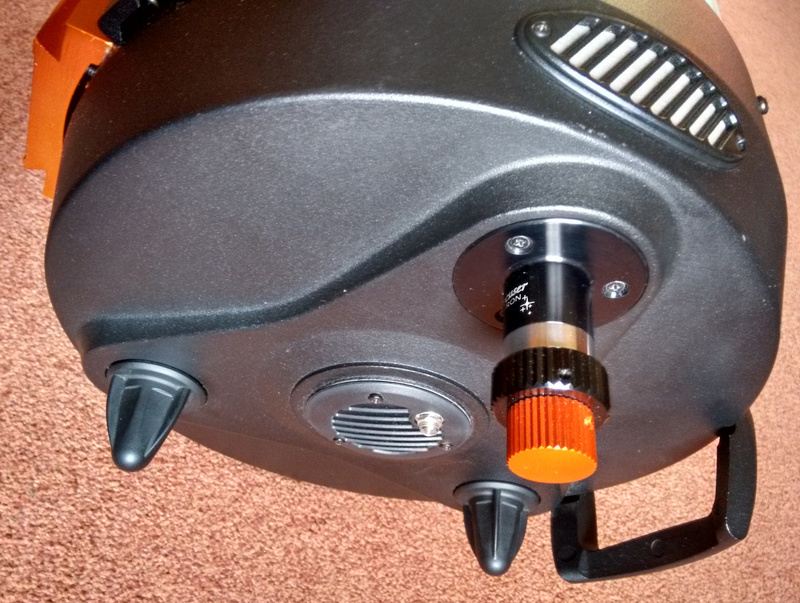 A 12V Maglev cooling fan (centre) improves airflow for improved cooling of the optical tube. Image credit: Ade Ashford. Without a camera in place, the 11-inch RASA is 84cm long from front cell to the rear of the FeatherTouch focuser and weighs a hefty 43lbs (19.5kg). It is therefore not an optical tube that you would wish to mount and dismount too often and is best suited to permanent observatory setups. For comparison, a HyperStar3-enabled C11 weighs 29.6lbs (13.5kg) and is 69cm from nose to tail, sans camera. While a Celestron CGEM mount is adequate for the later, a RASA needs a German equatorial mount with the calibre of a CGEM-DX or CGE PRO. The RASA has full-length Losmandy-style D-plate dovetails on the top and bottom of the tube for attaching it to your mount and installing a guide ‘scope. To keep weight down and simply the imaging process, you may mount a StarSense AutoAlign and dispense with guiding, since exposures will be typically one minute or less. Like a Fastar/HyperStar system, RASA images are mirror reversed, but it is a simple matter to flip the image after digital processing. Since the CCD or DSLR must sit in the entrance pupil of the telescope, so the shutter release cable of a DSLR or the power/USB cables to a CCD camera will introduce an element of diffraction since they must cut across the light path. The secret to minimising this is not to make the cable straight where it interposes on the corrector, but to give it a gentle curve: this will ensure that the diffraction is more evenly spread around the image rather than manifesting as a ‘spike’ or flare emanating from bright stars. Since the bodies of DSLRs typically have curved edges, diffraction is not as severe as one might first suppose. Attaching an APS-C-format or full-frame DSLR at the focus of Celestron’s RASA is easy with the included T-mount or M48 adaptors. Although the APS-C-format Canon 450D pictured here appears huge in relation to the corrector, this is merely the perspective of the wide-angle shot. While the camera sits in the incoming light path of the instrument, the curved edges of most DSLR bodies create very little diffraction noise — especially if one also gently curves the cable release used to actuate the camera. Image credit: Ade Ashford. If you are contemplating a Fastar C11 for flexibility, consider that a new HyperStar3 unit would set you back a further £1000. While a C11 + HyperStar will permit you to image at speeds slightly faster than RASA, HyperStar collimation is fiddly and occasionally ill-matched to your C11’s optics. HyperStar also limits you to APS-C-sized sensors and a lot of flat field processing is needed to remove vignetting. With RASA you have no such concerns, as it is an integrated system optimised for virtually any one-shot colour CCD or DSLR in existence. With sub-exposures of a minute or less, RASA + StarSense AutoAlign on a CGEM DX or CGE Pro mount means you can largely dispense with autoguiding for hassle-free imaging, making astrophotography fun again! StarSense AutoAlign beta firmware 1.12.14310 brings the much anticipated All-Star Polar Align (ASPA) feature to Celestron German equatorial mounts. 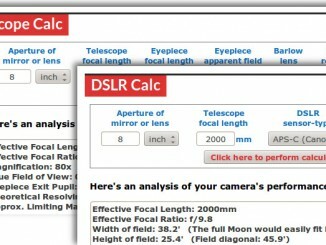 We bring you two more online utilities designed to help you get the most out of your telescope and optical accessories, both for visual use and astroimaging with digital single-lens reflex cameras.